This book is a result of at least five years work, on and off. Thoughts of writing it began after morning tea with my Byzantium scholar-friend. We had been discussing an aspect of Classic Roman history and in the process genius loci was mentioned. Over the years various people have suggested that I write about my life but I did not want to write a chronological account. 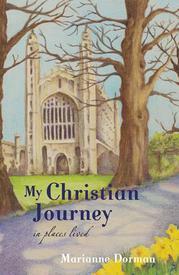 However writing about my Christian Journey from different places in which I lived did appeal. The result is this book. As well as some events in my life it also reveals my love of learning, teaching and appreciation of all that is beautiful and inspiring in life. It also unveils my years of study and writing on Lancelot Andrewes and other Caroline Divines and their influences on my life​. It also illustrates my appreciation of music, especially choral, of which that of the sixteenth and seventeenth centuries, especially Victoria and Palestrina and the English is my favourite. Lastly but not least it highlights my love of literature and history. I am grateful to finish writing this book in a place of overwhelming beauty, Penn Cove, Whidbey Island, one of many places I have lived during my life. On a fine day, the deep-blue water is so tranquil that it is like a painting, whilst on a wet, wintry day it is dark and disturbing. Both views remind me of music; the latter, Henry Purcell’s composition for the funeral of Queen Mary 11 and the former, William Harris’ Faire is the Heav’n. For this anthem, Harris set to music some stanzas of the sixteenth century poem, An Hymne of Heavenly Beautie by Edmund Spenser. As the title recommends to “behold the glorious face of the Divine” gives felicity to the soul. Perhaps even fairer, the poet thought, is to behold the whole hierarchy of the angelic realm as it waits on God. The combination of its beauty and brightness in service to the “Eternal Majestie” is the “image of such endlesse perfectnesse”. No, the heavenly court will never “pass into nothingness”. Beyond this life, there is something more beautiful and everlasting. What Spenser personified in his poem and Harris in music is what I have tried to visualise during life. What will the heavenly Zion be like? What discoveries wait? As I ponder that, words of Eliot ring in my ear, “Will I ever get there?” Being an admirer of the Johannine Gospel, I know that question must be tempered with its message that the Paraclete will teach you all things and those who believe that Jesus is the Son of God have eternal life now (Jn 14:26). Still I am a little perturbed by “will I ever get there” as Eliot suggested in The Journey of the Magi? In this poem, written shortly after his baptism, he juxtaposed birth and death. In being born anew, he suffered many deaths of the old way and will continue to do so as he expressed, “I shall be glad of another death”. Every death to self is a new beginning and a fresh realisation of the indwelling Spirit. I have written this book through the lens of various loci where I have lived, not in strict chronological order. In each locus, I sensed some of its history, spirit and attractiveness, as well as its challenges and discoveries that reminded me of what the Romans knew as genius loci. In living in these various loci, I am thankful for the privilege of having spent most of my life within various Christian communities, bonded through obedience to Christ’s teaching and with the freedom to let the Holy Spirit blow where He wills. I have valued the balance of tradition and inspiration, scripture and contemplation, prayer and ministry, and worship and service in knowing and loving the God of surprises. I am also mindful of those who have inspired me on my Christian journey. None influenced me more, as evident in this book, than the Caroline Divine, Lancelot Andrewes, who through my research and writing, has been part of my life for more years that I can remember. In many loci, especially when living in England, aspects of his life and teaching flooded my mind and soul. In modern times, there have been others too, especially Fr. John as a teenager, and the Lady Margaret Professor in Oxford when I first arrived in this city. In my later years, I discovered Fr. Raymond Brown, a renowned biblical scholar who gave me a fresh understanding of the New Testament and the early ekklesia through his writings and audios. Another discovery was the Franciscan, Fr. Richard Rohr, who taught me the importance of non-dualistic thinking as seen in Francis and Clare and other mystics. This has enabled me to accept, it is what it is in life and church and to allow God to do what He wants with my life. His way gives perfect freedom. I am thankful too for being a daughter, sibling, wife, mother, friend and more recently a nan to Lucy Irene. Even relationships bring their own discoveries and challenges.